© 1984 Dunvagen Music Publishers, Inc.
© 1987 Sony Music Entertainment Inc.
Akhnaten marks the culmination and conclusion of a lengthy period in my compositional life. It completes the trilogy of “portrait” operas I began in 1975 with Einstein on the Beach (in collaboration with Robert Wilson) and continued in 1979 with Satyagraha (whose libretto was a joint effort by me and the writer Constance de Jong, with the assistance of designer Robert Israel). I will leave detailed remarks about the historical Akhnaten to Shalom Goldman who, with Robert Israel and Richard Riddell, shared with me for over a year the pleasures and pains of shaping this libretto. That shaping began in January 1982, after Akhnaten had been commissioned by the Stuttgart Opera, and continued during the actual process of musical composition, which I started in the summer of 1982. Work on Akhnaten was hardly continuous, though, for during that same time span I wrote such fairly sizeable pieces as The Photographer and Koyaanisqatsi, as well as a number of less expansive works. Numerous performances and tours, some of them international, with the Philip Glass Ensemble further interrupted any musical excursions to ancient Egypt. Eventually, though, both music and text were finished (in July 1983) and, working with Michael Riesman, Kurt Munkacsi and Richard Einhorn, I proceeded to make a complete synthesizer recording of the opera “in real time”. I then sent the tapes to the Stuttgart production team eight months before the scheduled date of the opening. 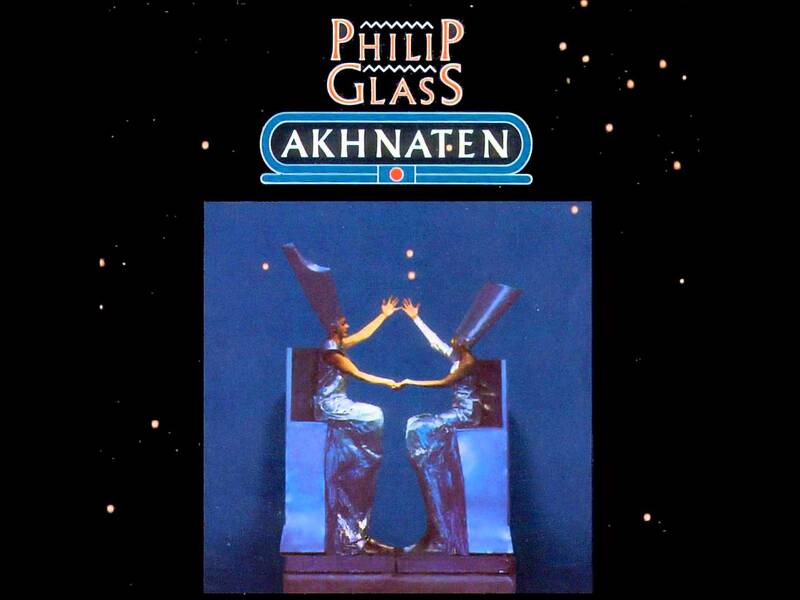 On March 24, 1984, Akhnaten had its world premiere in a production by Achim Freyer. Akhnaten, Gandhi and Einstein — three men who revolutionized the thoughts and events of their times through the power of an inner vision. This, then, is the theme of the trilogy. Einstein — the man of science; Gandhi — the man of politics; Akhnaten — the man of religion. These themes (science, politics, religion) are, to an extent, shared by all three and they inform our ideological and real worlds. We took all our texts from Akhnaten’s own time, the Amarna period. Decrees, titles, letters, fragments of poems, etc., were all left to be sung in their original languages, thereby emphasizing the artifactual slant of our approach. The greater part of the Amarna period has come down to us as fragments. Therefore, rather than to “make up” the missing parts of this ancient story — to fill in the gaps, as it were — we chose to present the historical period as we found it, much as we might learn from Akhnaten and his time from the partially told story revealed in the exhibition cases of modern museums. The original languages, their sounds and cadences as understood by contemporary scholarship, became part of the story to me and my collaborators. Our narrator provides the audience, in today’s language, with an account of what is being sung and spoken during each scene. Each of the three operas of this “portrait” trilogy has its own distinctive sound world. Einstein on the Beach, an opera about a great mathematician who loved music, is for amplified ensemble and small chorus singing a text compromised of numbers (actually the beats of the music) and solfège syllables. Satyagraha, a work about one man leading his people to freedom, is a large choral opera with text taken directly from Gandhi’s philosophical guidebook (the Bhagavad-Gita) in the actual language (Sanskrit) in which he read it. In Akhnaten, my emphasis is orchestral, with choral and solo voices sharing common ground with the orchestra. Should the three operas be performed within a fairly narrow time span (within the same week, for example), I believe their internal connection will become increasingly obvious and provide the audience with a coherent musical and theatrical experience. An opera in three acts for orchestra, chorus and soloists. Music composed by Philip Glass. Libretto by Philip Glass in association with Shalom Goldman, Robert Israel and Richard Riddell. Vocal text drawn from original sources by Shalom Goldman. Performed by The Stuttgart State Opera, Orchestra & Chorus. Directed by Dennis Russell Davies. Assistant Conductor: Anton Zapf. Chorus Master: Ulrich Eistert. Score Analysis: Martin Goldray. Featuring Paul Esswood as Akhnaten and Milagro Vargas as Nefertiti. Produced by Kurt Munkacsi & Michael Riesman, Euphorbia Productions, Ltd., New York, NY. Recorded at Karlshöhe Church and Tonstudio Bauer, Ludwigsburg, West Germany. Engineers: Martin Wieland, Carlos Albrecht and Johannes Wohlleben. Location Manager: Eva Bauer Oppelland. Location Equipment: Reiner Oppelland. Digital Engineer: Paul Cameron. Additional Recording and Remix: The Living Room, New York, NY. Engineers: Don Christensen and Miles Green. Record mastered by Bill Kipper at Masterdisk, New York, NY. Cover and booklet design: Georgina Lehner.